The LS7805QIK takes portable lighting stands to the next level with sleek styling and a super-stable design. 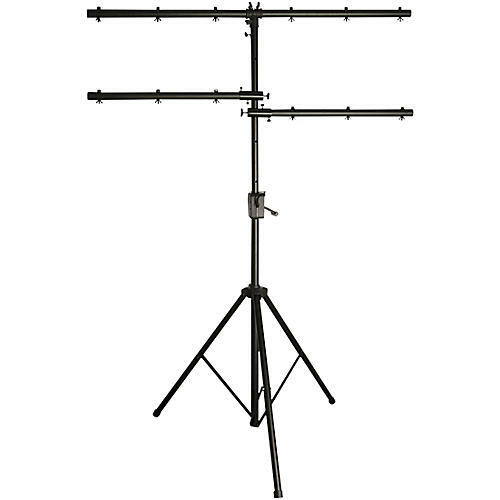 Height adjustable from 54–132", the aluminum, black powder-coated LS7805QIK can be operated by hand or with any standard cord or battery-powered hand drill. The 48" long, 1.5" diameter top bar accommodates six PAR cans, while two, independently adjustable and quickly mounted side bars support three additional par cans each. And with a 54" tripod base deploying the 1.5" diameter upper shaft with 1.37" tubing, the LS7805B comfortably supports up to 80 lb. of show-stopping illumination and effects.